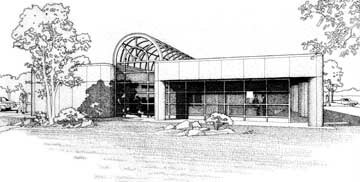 Randal Birkey was contracted by a Chicago area architectural design firm to create an illustration of one of their branch bank designs to present to their customer. Randal worked from the architect’s scale blueprint drawings to create this perspective view. Once the view was approved, it was rendered in a pen and ink stipple style using Rapid-o-graph ink pens on 20″ x 30″ cold press illustration board. © 2018 RANDAL BIRKEY @ BIRKEY.COM • All Rights Reserved.